I eat porridge for breakfast most mornings with various toppings but have never written a post before. This morning I had jumbo oat porridge topped with apples and plums. I always add some bran and soak the oats in the milk and water for at least ten minutes as I think this makes the final result lovely and creamy. I also always use a mixture of milk (now I use almond milk) and water largely as it is the way my mum used to make it for me as a child. You need 2 parts liquid to 1 part oats. Bring it to the boil and then turn it down and simmer for around 5 mins until creamy. 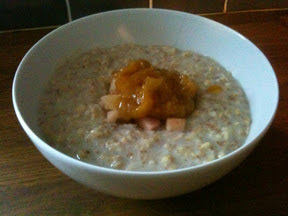 I served up with bowl of porridge and then topped it with some chopped cooked apple and a plum compote using the wild plums mentioned in this post. I made the compote with no added sugar simply by cooking the plums very slowly for a very long time until sticky and yummy. I've heard it referred to as Hungarian Jam before. I then flooded the edge of the porridge with a milk (I use almond milk). You can also add a sprinkle of dark soft brown sugar or a drizzle of honey if you want extra sweetness (if you want it to be clean skip the sugar and if you really need the sweetness go for a natural sweetner).